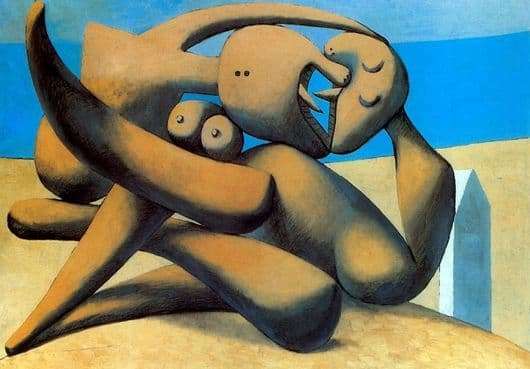 This is one of the most famous works of Spanish painter, sculptor and designer Pablo Picasso. The painting was written in 1931 in the genre of surrealism. And although Picasso was little interested in the ideas of the Surrealists, in a certain period of his late work he found inspiration in the so-called principles of mental automatism and special, convulsive beauty. To a large extent, surrealistic poetry influenced Picasso’s perception of that period. One way or another, but for several years the artist wrote works in which he rather radically portrayed human nature. The atmosphere of the paintings creates a world of hallucinations, convulsive movements and incessant hysteria. Under the artist’s brush, images of monsters appear, splitting into pieces, screaming, turning into something unknown. The painting “Figures on the Sea” embodies one of these metamorphoses, combined with aggressive eroticism. Technique writing work looks free and difficult at the same time. Running interlacing lines creates complex geometric shapes. To emphasize this, Picasso resorts to bright color accents. In the period of surrealism, women in Picasso’s paintings are depicted in a frightening way and resemble the complex details of an unknown car. Human limbs lose their usual shape for the viewer, becoming like sharp, smooth, perfectly carved parts. Instead of the usual facial expressions – grin and sharp teeth. In this interpretation, the female appearance acquires threatening, predatory features. As if the female body breaks up into its component parts, from which the monster is formed by the will of the artist. The painting “Figures on the Sea (Kiss)” is in the artist’s personal museum in Paris. Further surreal experiments with human nature inspired Picasso to create sculptural works.